Ford plays Frankenstein and mashes their Focus RS and baby Mustang together to create a monster. Isn't it weird how some things just work out? Take, for example, the Ford Focus RS as it nears the end of production. Although sad news in itself, it does mean the tooling to build its engines in Valencia won't be particularly busy – good news for the Ford Mustang then. Not sure what I'm talking about? Okay, let me explain. When we talk of muscle cars, most people immediately think of the bruisers, The Mustang GT, Challenger Hellcat Redeye or Camaro ZL1, for example. But very few consider the 50% of Mustang owners who purchased the 2.3L EcoBoost. That's a significant percentage in anyone's book and enough incentive for some of the Mustang team members to do something about it. The story goes that the engineers were struggling to find a reason to feel passionate about the EcoBoost chassis development test car they were working on. Then one of them found a Focus RS development engine lying around and decided to see if they could get the two to fit. Not an easy task, though, as the longitudinal rear-drive chassis was not built to accommodate the transverse engine. Eventually, the responsibility fell onto Hau Thai-Tang, Mustang's product development vice president, who set out a 10-month game plan to create the "most powerful four-cylinder Mustang in history." To solve the fitment issues, the turbo was redesigned to accommodate for the different exhaust plumbing, they changed up the intercooler, customised the standard active exhaust system and re-tuned the electronics to meet both the extra power gains and to work with Ford's optional 10-speed automatic. To accommodate for the extra power from the new turbo, Ford strengthened the cylinder head and gasket materials. Translated, this means the new model receives 20 extra horses, the 350 lb-ft of peak torque remains the same but is available across 40% more of the torque plateau. Now, there is 90% of peak torque available between 2,500 and 5,300 rpm. Engineers also managed to achieve 90% of peak horsepower right up to the 6,500-rpm redline for both the manual and auto variants. Ford is aiming for a 4.5-second 0-60mph time in the automatic, shaving off almost a second from the current fastback, and should gallop on to a 155-mph top speed. The changes are not just to the powerplant though. Optional extras include an EcoBoost Performance Package which includes a new aluminium shock-tower brace, a set of 32.0mm hollow front and 24mm solid rear anti-roll bars, and a 3.55:1 Torsen limited-slip rear differential. Brakes from the GT supply stopping power, 13.9-inch in the front and 13.0-inch at the back, and a set of 9.0x19-inch wheels with a 255/40ZR-19 three-season Pirelli wrapping make contact with the tarmac. The High-Performance 2.3L Mustang also gets a mild makeover. The upper and lower grilles and side mirrors are coated in a metallic graphite paint with "whisker stripes" on the vented bonnet, while a unique faux filler cap sits on a black "finisher" between the taillights. Climb inside and you're greeted with an engine-spun aluminium instrument panel housing analogue oil pressure and turbo boost gauges and a plaque on the dash that displays the vehicles unique serial number. The seats are cloth but can be upgraded if cow-hide is more your sort of thing. 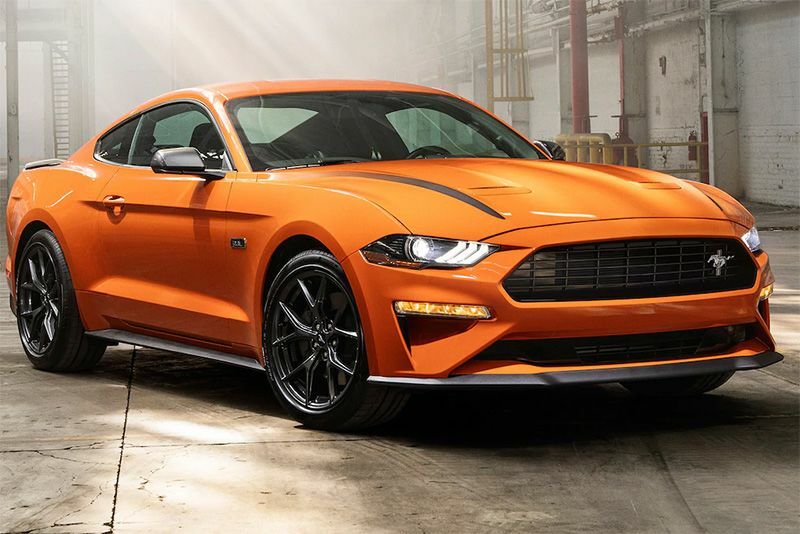 The package is available on both the fastback or convertible, as are the four new Mustang paint colours for 2020: Twister Orange, Grabber Lime, Red Hot, and Iconic Silver. But that's not all. Ticking a different options box for the fastback and you'll receive Ford's handling package, with specially tuned MagneRide shocks and increased brake-cooling for the new semi-metallic brake pads. The wheels and tyres get wider, 9.5x19-inch and 265/40ZR-19 Pirelli P Zero Corsa4 respectively, uprated front springs and 33.7mm hollow front anti-roll bar. Lighter than its bigger brother, the new EcoBoost High-Performance 2.3L balances out with a 53 front/47rear percentage weight bias, which means it should be great for tight and technical handling circuits but won't be able to match the all-out grunt of the GT in a straight line. The Ford EcoBoost High-Performance 2.3L Mustang is due for US release in the third quarter of this year, there are no prices yet but expect it to still be way cheaper than a GT. There's also no word on whether right-hand-drive models will be produced for markets that drive on the correct side of the road. We wait and see.